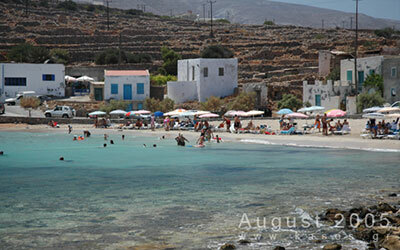 Emporios, an old commercial port approximately 500 meters west from Fry, has a small sandy beach that gathers today most swimmers of the island during the summer months. It’s an organized beach, surrounded by two restaurants and a pastry shop, and you can easily spend a whole summer day relaxing & enjoying the sea. You can also take from there various boats that sail around the island or that take you to the Church of the Panagia, which is the largest church on the island.